This is so wonderful, you’ll be quacking your head off. If you can’t get wild duck, get Maple Leaf Farms Duck. They produce the best duck around. 1 tablespoon Awesome Antler Rub plus a little extra to shake on before grilling. Rinse duck in cold water, pat dry and place in a large Ziplock bag, pour the vinegar, agave syrup, port, almond oil and Awesome Antler Rub. Marinate for 4 hours and you can marinate overnight if you wish. In a small sauce pan add all ingredients and simmer until port reduces and mixture is sauce-like. Maybe 15 to 20 minutes. Keep warm. Heat grill to high and remove duck from marinade. Place on a platter and shake on a little more Awesome Antler Rub. Sear the breasts both sides skin side down first. Reduce heat to medium and grill for 8 to 10 minutes each side. 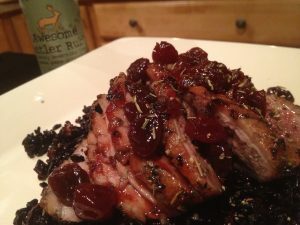 Remove from grill and serve with Tart Cherry compote over Lotus Foods Forbidden Rice, 1 teaspoon Yellow Dog Sweet Shake with chopped dried tart cherries and toasted pecans.